Seniors (12th grade) who are paid music booster members will not need to purchase a ticket but still need to RSVP. 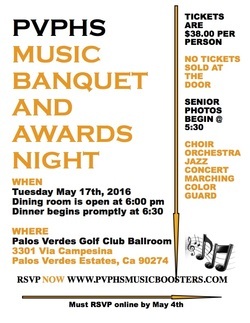 PVPHS Music Boosters invites you to our annual Awards Banquet night. All students, families and friends of Choir, Concert Band, Jazz band, Marching Band, Orchestra, and Color Guard are invited to share in the celebration! Graduating Seniors will be honored and recognized, scholarships and special awards will be announced, and select students from all grades and all music groups will be recognized for special awards. Everyone else check-in begins at 6:00 p.m. Dinner begins promptly at 6:30 p.m.
$38 You will not be able to buy tickets at the door. Please complete the form below if you plan to attend for our head count (including senior music booster members). You may also pay on-line below or send in a check payable to PVPHS Music Boosters attached to the PDF form below.